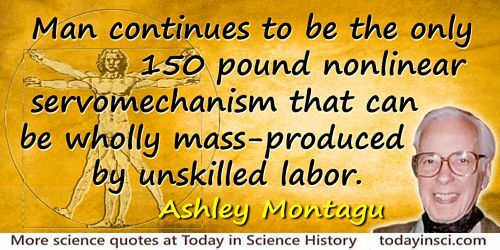 Man continues to be the only 150 pound nonlinear servomechanism that can be wholly mass-produced by unskilled labor. In 'Mechanisms in Anxiety', Journal of Neuropsychiatry (Sep-Oct 1963), 5, 416. Also appears as “Man is the only…reproduced…” for the opening sentence by Ashley Montagu in 'Forward: Origin of the Specious' for Robin Fox, The Passionate Mind: Sources of Destruction and Creativity (2000), xxi. The problem with linear theory is that it is not nonlinear. Epigraph in Mathematics in Nature: Modeling Patterns in the Natural World (2003), 173. Quoting from his own first professional presentation as a first-year graduate student.